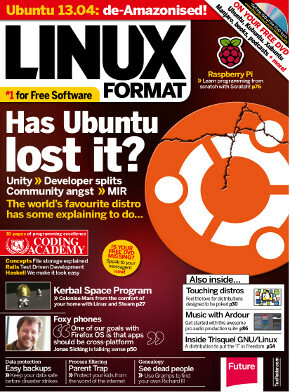 Issue 172 (July 2013) - Has Ubuntu lost it? With its Distrowatch ranking falling faster than Man Utd now that Sir Alex Ferguson has departed, Ubuntu is no longer the all-conquering force that it was. So what's happened? Has it, in fact, lost it, or is there a more subtle game afoot? We answer this conundrum (sort of) in the latest Linux Format. We also invite you discover the ethos that's powering Trisquel, the freeest distro of all named after a Gaulish God; learn the fundamentals of programming with Scratch and Coding Concepts; and get acquainted with your ancestors without travelling through time with the excellent Gramps genealogy application. All this, plus Hotpicks, Sysadmin, tutorials and more, in Linux Format! On The DVD: Our own Privacy Enhanced remix of Ubuntu and regular versions of Kubuntu and Xubuntu. Plus Manjaro, free (as in speech) books, software and more.